Here we go again with the Confederate monument removal business. The state Historical Commission announced Friday its five members to serve on the committee to study what actions the full commission can take. The committee’s first meeting is Jan. 22. It’s supposed to report to the full commission in April. Most of us had forgotten that Governor Ray had requested the removal of three monuments. These statues have stood on the Capitol grounds in Raleigh for a combined 330 years. Governor Roy Cooper wants to move three monuments which have stood on the state’s capitol grounds in Raleigh for a combined 330 years. Cooper wants to move the three monuments to a battlefield 50 miles away in Johnston County. Cooper, as a legislator and then later as the state’s attorney general, had previously taken no issue with any confederate monument or statute in the state nor on the capitol grounds. 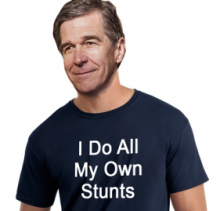 It was not until after protesters affiliated with a communist organization toppled a statue in Durham did Governor offered any opinion on the matter. So far, 11 arrests have been made in connection with the Durham statue. Cooper failed to condemn the criminal activity. Instead, Cooper lamented that unless other monuments are taken down, protesters could get hurt. There’s more. Go read the rest. This entry was posted in #SJW, LL1885, POLITICS NC, Roy Cooper and tagged Confederate Monuments, Roy Cooper. Bookmark the permalink. It’s sad to see that many of our government officials are coordinating with communists in this mission to stamp out memorials to dead North Carolinians.